This guide was created to help you find English as a Second Language (ESL) library and Web resources. Click on the tabs above to find information on Reading, Writing, Listening, Speaking, Vocabulary & Grammar, Citizenship, and TOEFL. Your Student Photo ID (your OwlCard or DASB card) is used as your library card. You may use your student ID number with a photo ID in place of the OwlCard or DASB card. We encourage you to obtain your ID at the Smart Shop (room 2016) in the Campus Center to expedite transactions. All books including audio books and ESL books may be checked out for three weeks and may be renewed twice. Periodicals may be checked out for one week and renewed twice; Current issues of newspapers, and reference books are for library-use only. You may renew materials in the library at the Circulation Desk or use your library account online to renew them. Please check the Reserves Desk for select materials placed on reserve, such as, textbooks, calculators etc. Loan periods for these materials vary. There is a minimum 30 minute waiting period before checking out the same reserve material. This policy is to assure that other students have access to the materials. Library overdue notices and bills are sent to patrons as a courtesy, using the e-mail address supplied at registration. It is the patron's responsibility to keep the library informed of e-mail or telephone changes. 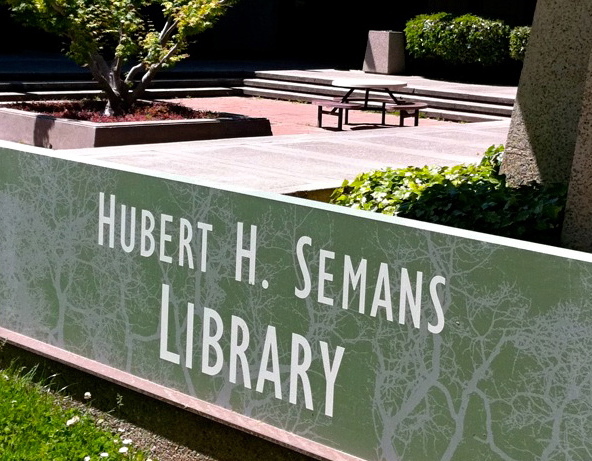 If the library catalog shows that a book you want is checked out, you can place a hold on it. From the results list, click on Details and then look for the Place Hold link in the left hand column. Reserve textbooks may not be placed on hold. Items may be returned to the staff at the Circulation Desk or to the book return slots at the Circulation Desk. During closed hours, please use the book drop in front of the library to return your material. Please return material on time to avoid late fees and to make them available for others. Items checked out from the circulating stacks area are fined 25¢ per day. Fines for reserve materials are 50¢ per hour. The maximum fine per item is $15. If you lose any library material, or, if the material is returned significantly damaged, you may replace it with an acceptable* copy of the item, or, you will be charged a flat replacement fee. Computer workstations are available in the library to conduct research using the online catalog, databases, and the Internet. You may use any available computer. Wifi is available in the library. The wireless network name is College Wifi. To log in, launch a browser and sign in using your 8-digit student ID and the password you use for MyPortal. NOTE: This is a secured connection. College Guest or College Visitor wireless networks may be used if you do not have your student ID. There are two copiers in the library. The cost for copying is 15¢ a page. There are two ePRINTit machines in the library. The cost is 15¢ a page for B/W printing and 50¢ a page for color printing. Please log in to MyPortal and click on ePRINTit under the Students tab for more information. There are 10 study rooms available in the library. Please click here for the study room use policies. *Replacement copies are subject to review. Please talk to us before making the purchase of a replacement copy. 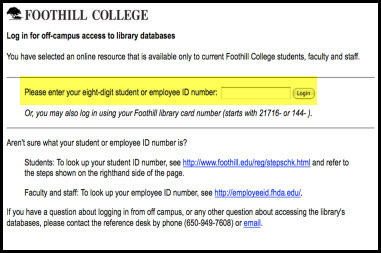 For off-campus access to the online databases, journals, and eBooks, use your eight-digit student ID (as shown in the image below). You can also renew your books online from home.